Rudy: With Memorial Day upon us, let’s get one thing straight: barbecue is not a thing you host (i.e. “We’re having people over for a barbecue”) – that is a cookout. Barbecue is smoked meat. Growing up in North Carolina I always thought that only meant smoked pork. However, moving to Texas has taught me that BBQ also stands for beef brisket. And it is beautiful. Speedy: I think we all agree that barbecue is a noun, not a verb, and I’ll even agree that it can include brisket, ribs, sausage, or even chicken and turkey for the lady-folk, but we all know that chopped pork is the king of smoked meats. But we were in the heart of Texas, so I was willing to put aside my pre-conceived barbecue notions and sample some Texas ‘cue. Monk: With that in mind, I was so very pumped that we were going to be able to make the 35 minute drive outside of Austin to Driftwood, which is truly in the middle of nowhere. Once you finally get there, the ranch itself is pretty impressive. 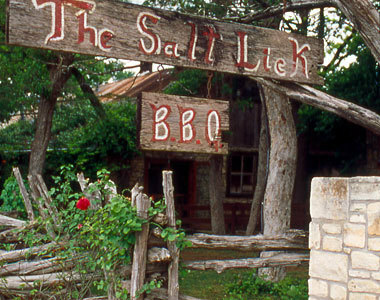 In addition to the restaurant itself, which contains indoor and outdoor seating, the Salt Lick Cellar sells wine and champagne and there is also a banquet hall for events or weddings. 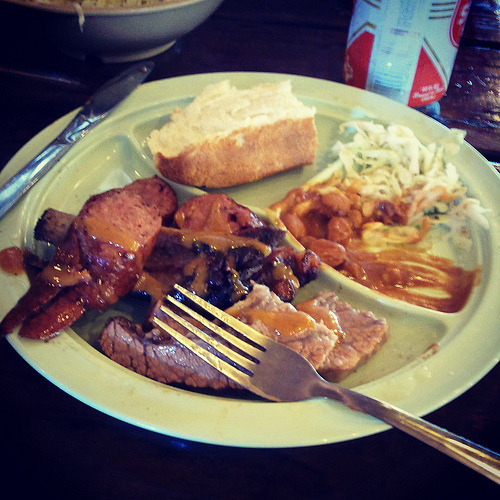 Speaking of alcohol, that brings me to one of the best parts of The Salt Lick experience – it is BYOB. Just load up a cooler with all of the Lone Stars it can fit and have a seat while you wait for a table. Waits can potentially be long, though it only took our group about 20 minutes on a Saturday for lunch to get called. There was even a live band playing to entertain while you wait. Not a bad way to kill time while you prepare yourself for what’s to come. Speedy: The first thing you notice when being walked to the table is the barbecue pit. It’s a circular stone pit with a wood fire and brisket, ribs, and sausage piled high on the grill. It is literally the most beautiful thing I’ve ever seen. 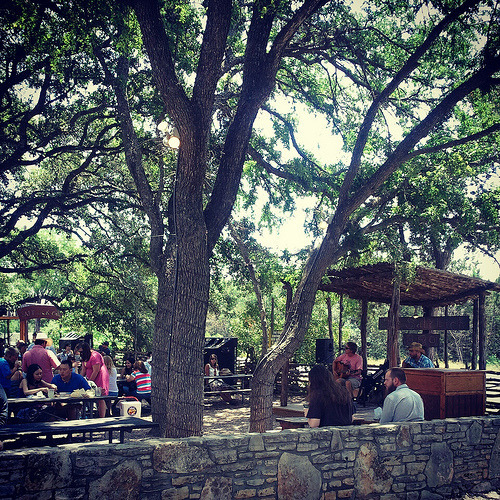 We were seated at picnic tables and our incredible experience was about to begin. Rudy: And incredible it was. The menu allows you to pick and choose a meat or two a la carte, or for $19.95 you can pick the all you can eat option, which includes brisket, ribs, sausage, and 2 sides. Monk: …we went with the all you can eat option, ordering baked beans and slaw to go along with our meal. Speedy: The food came out relatively quickly, with the sides, bread, and a plate piled high with the meat. Clearly, this wasn’t going to be enough, so we ordered a second plate immediately and started digging in. Rudy: I really enjoyed the sausage. It had lots of flavor and did not have a hard consistency like it had been mass produced. Monk: I’m relatively new to Texas-style barbecue sausage, but I agree with Rudy that it had a lot of flavor. There are a few local places in Charlotte that try this style, and I’m becoming a fan the more and more I have it. This, obviously, was better than what we can get in Charlotte. Rudy: The brisket was also very good, and could have been eaten without needing sauce, except for our 2nd (of 3) plate. That brisket was very fatty. However the brisket was still juicy and delicious overall. Speedy: Honestly, I was a little disappointed in the brisket. The good brisket we got was very good, but the second plate was really disappointing. I know brisket is really difficult to cook, but I was hoping for a bit more consistency between the briskets. Don’t get me wrong – it was still good – I just knew that second plate could be so much better. I do want to mention the sauce here. Provided to us was a spicy BBQ sauce that mixed really well this the brisket. I actually thought the sauce was so good that I found myself sopping up the leftovers on my plate with bread and eating that. Monk: True that on the sauce. I had more bread than I reasonably should have just by doing exactly what Speedy just described. As for the ribs, they were very solid, with the tender texture you would expect from a reputable barbecue joint. Rudy: My only complaint was the side dishes. They put almost no effort into them and they were very disappointing. But this is a Barbecue Blog and not a side dish blog, so we’ll move on. Speedy: Overall, we had a really great time. Big ups to Rudy for showing us his ‘hood and taking us to this great place. Monk: Word. I’m not sure that I even ate anything the rest of the day – partly because I have a tiny stomach and partly because the food was just that good. 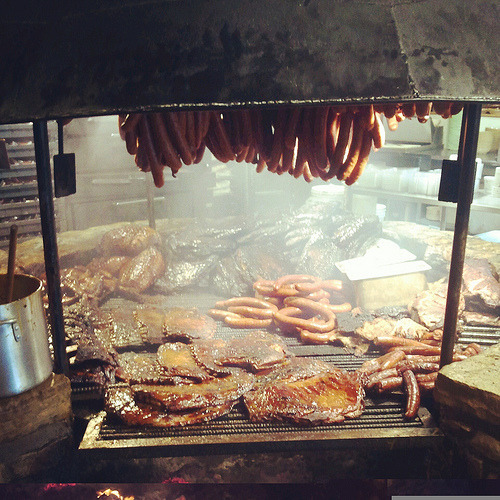 Rudy: The Salt Lick may not be the best barbecue in Texas, but it’s not too far off. The atmosphere itself puts it up there with the elites. It was a great way to show Speedy and Monk that barbecue doesn’t just come from pigs.